Beginning in the 1920s, the Soviet Union became obsessed with centralized planning of its economy and industrial development. Twelve such plans were adopted by the USSR during its history. While economists differ, it is largely agreed that these plans caused more dislocation within the Soviet economy than they resolved. One of two excellent Early War US events for the USSR, the other being Duck and Cover. By playing it on your last Action Round, you can discard the one remaining card in your hand, which, conveniently, happens to be a scoring card for a region that you don’t want to score. This is the only way for the USSR to get rid of a scoring card without playing it. Even if you aren’t using Five Year Plan to discard scoring cards, its discard can be timed to mitigate the effect of a low-Op US event. For instance, OAS Founded is a hugely problematic card for the USSR because you only have 1 Op to deal with the 2 US influence it places. But by playing Five Year Plan when you only have OAS Founded left, you are now able to respond with 3 Ops instead of just 1. Similar tricks can be performed with most of the other annoying US 1 Op cards (e.g., Sadat Expels Soviets, Truman Doctrine, etc.). On the other hand, Five Year Plan can be a serious liability in a hand of DEFCON suicide cards. Either you risk playing it early on (hoping the US doesn’t draw one of the suicide cards), or you’re forced to treat it as yet another unplayable card in your hand. Almost always played for operations. Occasionally played for the event: one possibility is that you know that the USSR is trying to hold a DEFCON suicide card, and by cutting their handsize (perhaps in conjunction with other handsize-reducers like Grain Sales to Soviets), you can force them to play it and lose. If you’re able to hold onto the China Card and play several discarders against your opponent, you might be able to force a DEFCON victory. Alternatively, if you’re desperate, you might play it in hopes of drawing an otherwise game-ending card like Wargames or an unfavorable scoring card. In the Early War, with excellent card knowledge, you may be able to force out De-Stalinization or Decolonization if you are fortunate. The event is also more attractive while under Red Scare/Purge, since it slows the USSR down at the cost of only 2 Ops. Otherwise, you should always play this for operations. 3 Ops is quite valuable in the Early War for the US, and moreover, playing Five Year Plan risks drawing Duck and Cover and losing the game by thermonuclear war. This entry was posted in Early War, US Events and tagged five year plan. Bookmark the permalink. to play the China Card. Interesting strategy. I never tried it, but sometimes it’s worth the 3 Ops.You can also use this to disarm Blockade (temporarily, until next Reshuffle) if it has not been played yet and you think USSR could hold it. So it is played the best on AR5 (in Early war) if you want to try this. Never forget how great this card can be for the US to cause USSR DEFCON suicide. If it is Turn 3 and CIA Created has not yet been played AND the USSR does not have the China Card, then US can just play it for the event and cause an easy DEFCON suicide win. Same thing happens if USSR has this card AND CIA Created in their hand, but no China Card, IF USSR does not headline CIA Created. True, but USSR has to have some influence in third world states (usually through Fidel). This is quite easy way for USSR to play around CIA created in first 3 Turns. I was surprised to see that this card is rarely used as the event because I have often used it as an event to great effect. Then I realized why. I play almost exclusively CCW with my friends and this card is a lot more valuable when it means the USSR can’t hold a card, especially in the Early War. I’m confused. If the US player is holding this card and plays it for the event, wouldn’t that mean the US is the phasing player, and thus the forced DEFCON suicide would mean that US loses? 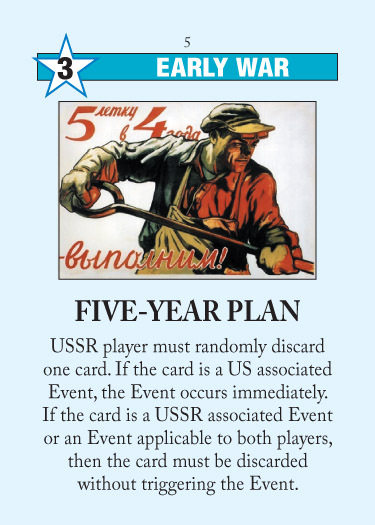 It will force USSR to discard a card, thus leaving them unable to hold a card and needing to play their whole hand. Of course. But for it to lose you the game, they not only have to have Duck and Cover in hand, you also have to hit it with Five Year Plan. If they have Lone GunmanCIA Created in hand, you just have to hit any other card for you to put them in a really uncomfortable spot. I think you mean CIA created, not Lone Gunman. I was USSR, holding CIA Formed, so I bit the bullet and headlined it on Turn 4. Having seen my hand he played Five Year Plan, pulled Grain Sales, pulled Nixon Plays The China Card, and then pulled the China Card. Ouch. If it makes you feel any better, it’s a stronger event for the USSR even though it’s supposed to be pro-US. It’s especially important for the Chinese approach to TS, which emphasizes the space race and maximizing early VPs. The weakness of this strategy is that you’ll be dominated in multiple regions, but FYP lets you discard a bad scoring card. Put it to you this way: one of the top Chinese players considers FYP the single most valuable card to hold onto as the USSR (not counting China). Yes, even more important than UN Intervention!